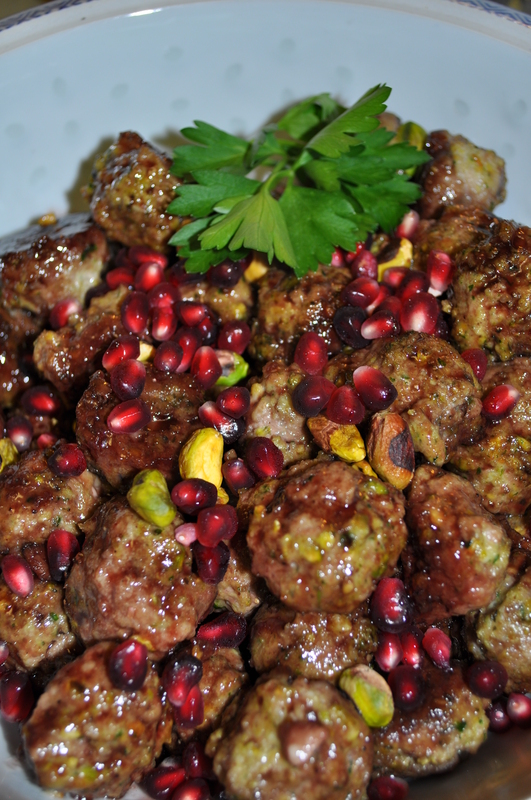 Posted by sarahsjoys in Main Course, Pomegranate, Sauces, Jams, etc. 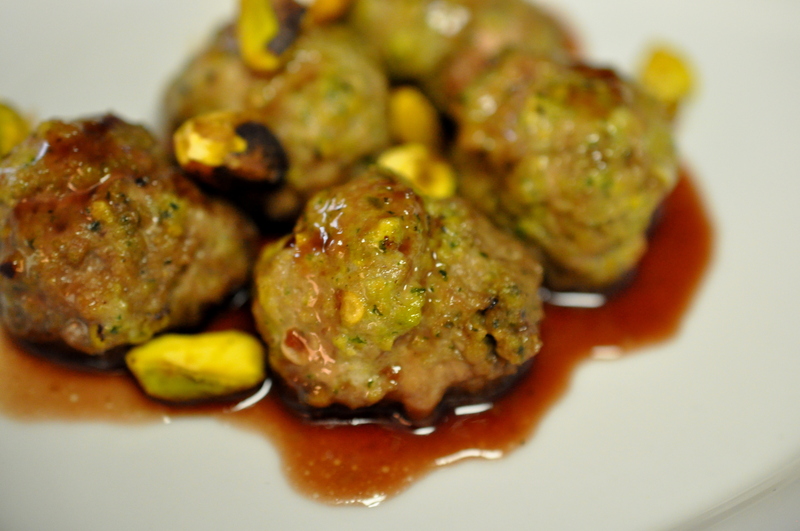 Sweet, tart, and spicy come together with the unique flavors of pistachios and tarragon to give these ultra-tender meatballs significant “wow” factor. You would think I had invented this recipe for how pleased I am with it, but I didn’t. 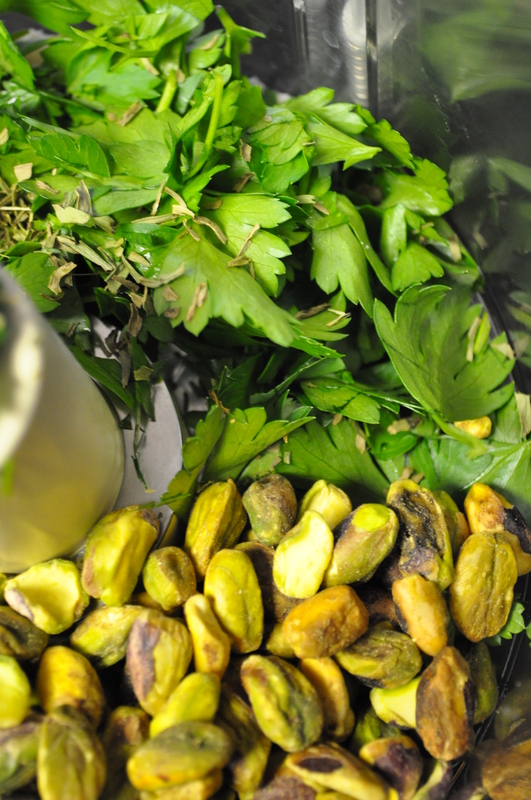 It is originally from “Food of Life: Ancient Persian and Modern Iranian Cooking and Ceremonies, 25th Anniversary Edition,” by Najmieh Batmanglij but came to me via an online Washington Post article. I actually found it because I was too tired to go grocery shopping! Last night was the biggest women’s event of the year for our church. 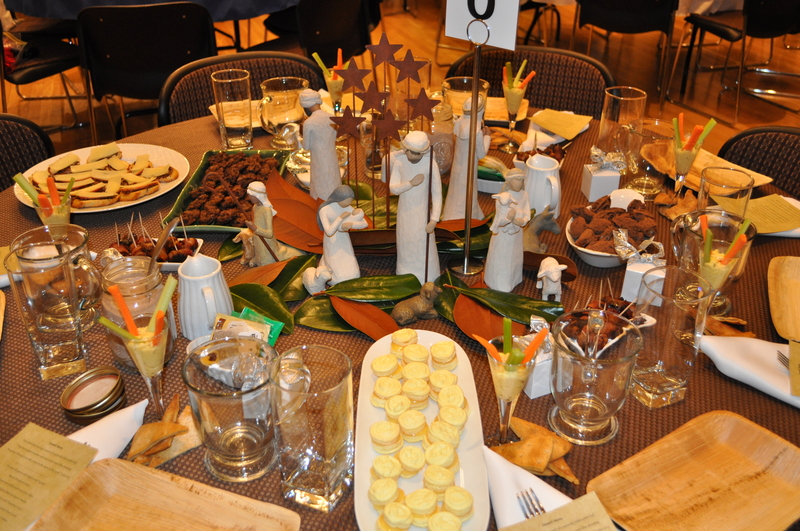 It was a dessert event in which over 500 women are hosted in the beautiful ballroom at the Provo Library every year. It is a lot of work but is always worth it. May I share a picture of the table I hosted this year? Every year I set aside the day after the Women’s Dessert as a REST day, and believe me, I need it! So I will admit to you that MOST of today involved relaxing, and even catching a little nap while Lilly was down for hers. (I wasn’t in bed until 11:30 and Lilly was up at 5:30! I don’t do well with lack of sleep!) The one thing I wanted to get done today was getting a real meal on the table. I did NOT, however, feel like going to the grocery store. I knew I had a few fun ingredients on hand and was determined to put a delicious meal on the table using nothing but what I had on hand. The success I found in this meal exceeded my expectations! I think Andy had about 12 servings. It was so good, I’m thinking of making it for my in-laws when we head there for Christmas. 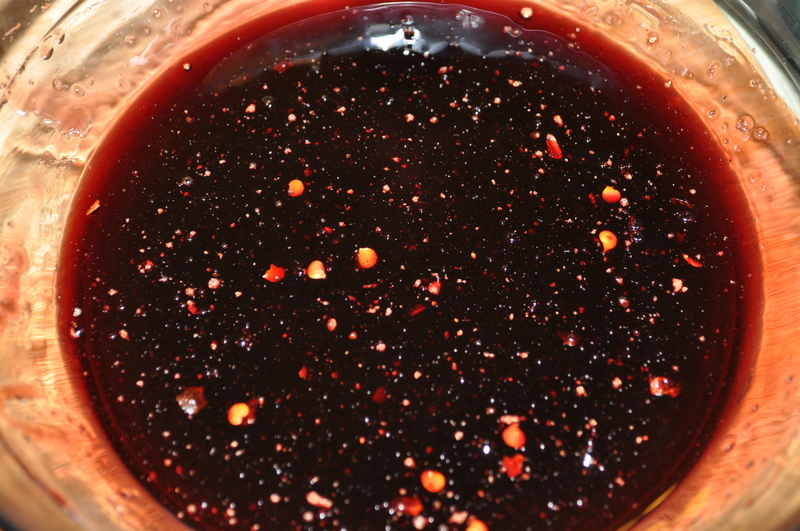 That will involve making more Pomegranate Molasses, but that just gives me the chance to blog another recipe for you! I really only changed two things: The original recipe called for ground lamb but I didn’t have that on hand nor is it easily accessible to me, so I’ll probably always stick with the turkey. I also did not have fresh Tarragon on hand so I used 1 Tbsp of dried Tarragon. Any of my notes are in italics. MAKE AHEAD: The meatball mixture needs to be refrigerated for at least 30 minutes and up to 1 day. Leaves from 1 small bunch tarragon (1/2 cup loosely packed) or 1 Tbsp dried. 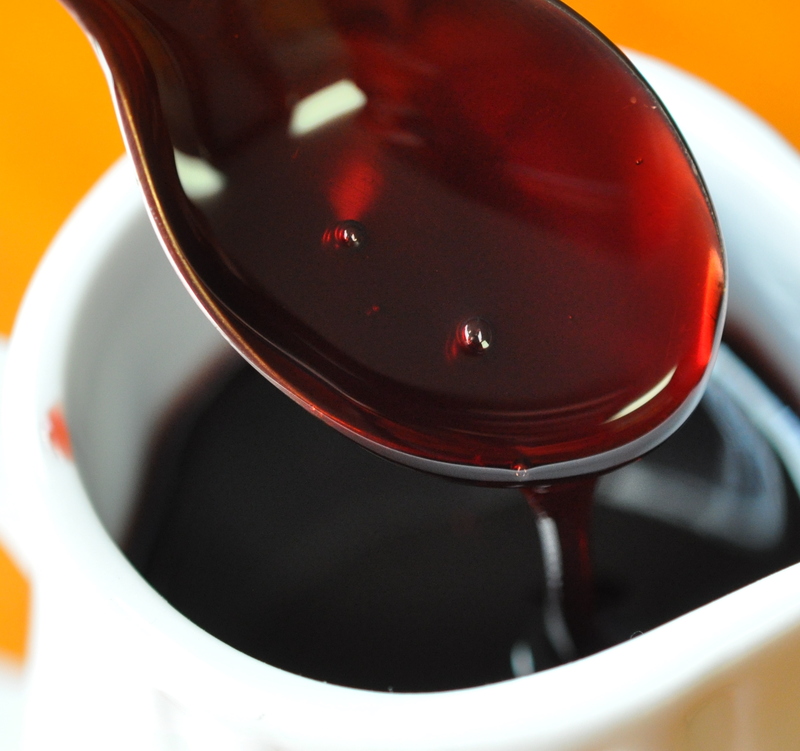 3/4 cup pomegranate molasses, such as Sadaf brand If you can’t find this where you live you can make your own. The recipe is below. 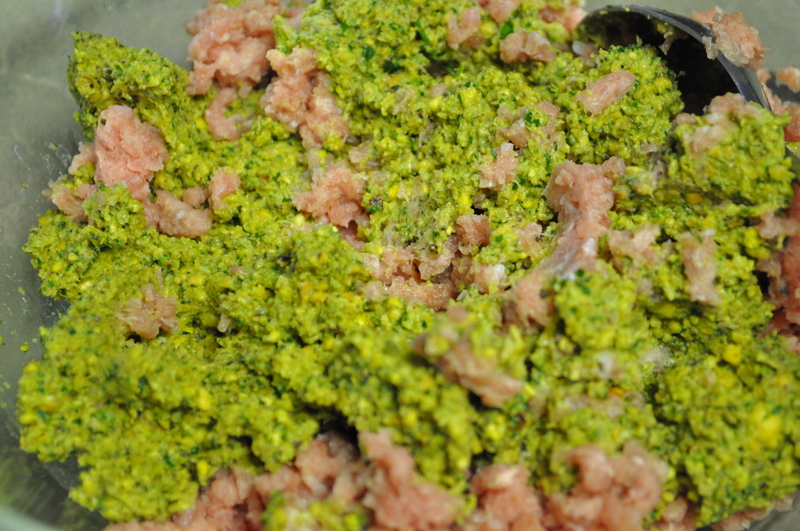 For the meatballs: Combine the onion, pistachios, bread crumbs, parsley, tarragon, lime juice, crushed red pepper flakes, black pepper, cumin and sea salt in the bowl of a food processor; pulse to form a grainy paste. Transfer to a mixing bowl. Add the ground turkey and egg; use clean, damp hands to knead the mixture for a few minutes, being careful not to overmix. Cover and refrigerate for at least 30 minutes and up to 1 day. 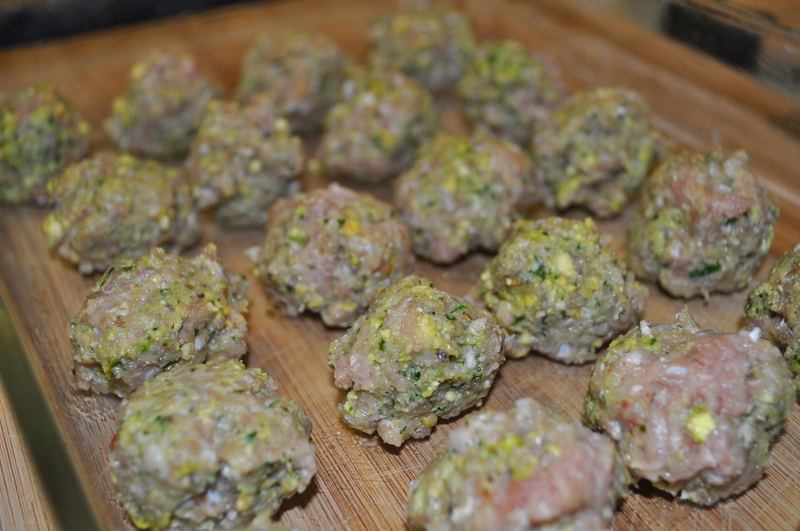 Shape the meatball mixture into 30 to 45 bite-size balls (about 1 1/2 teaspoons each). 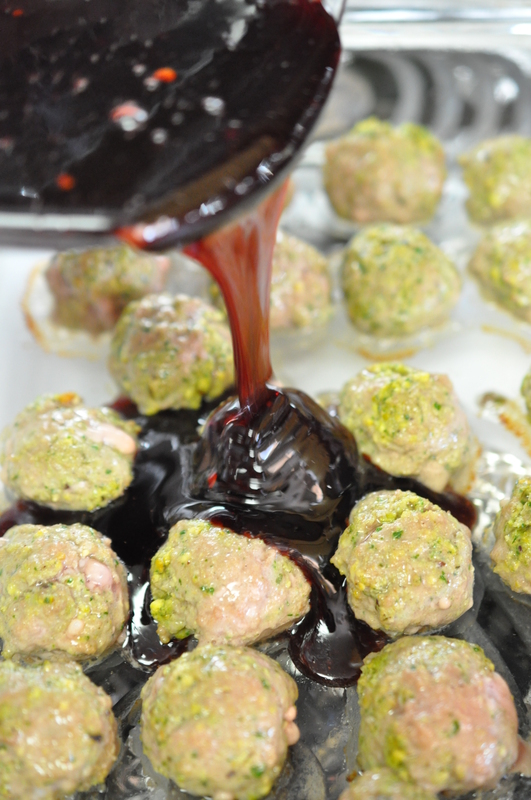 Place the meatballs in the baking dish and turn them to coat with the oil, leaving space in between. I poured the oil into a boil, then well oiled the bottom of the baking dish and brushed the top and sides of the meatballs lightly with oil. I didn’t want them sitting in that much oil. It worked very well. I also needed one 9×13 pan and one 7×11 pan for all the meatballs. 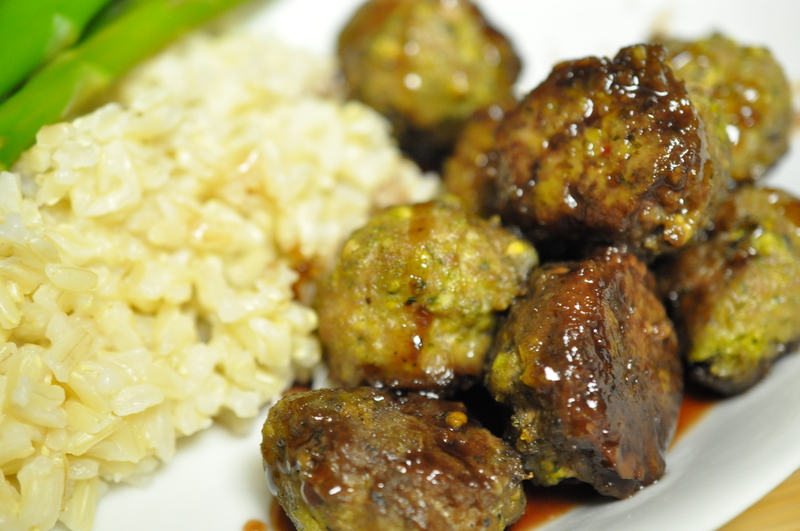 Bake for 10 minutes; the meatballs might look a little pink. Reduce the oven temperature to 400 degrees. 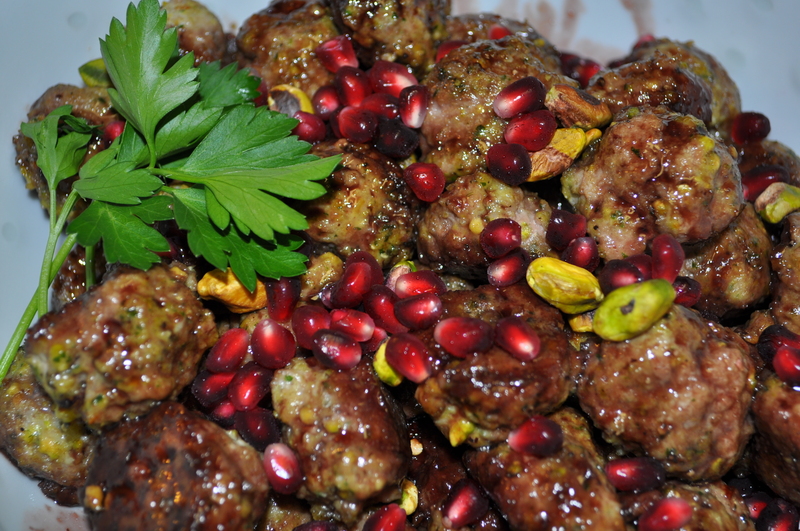 Pour the glaze evenly over the meatballs; bake for 5 minutes to infuse them with the flavor of the pomegranate. Taste the glaze again; add honey or pomegranate molasses as needed to balance the flavors. The meatballs should be cooked through. 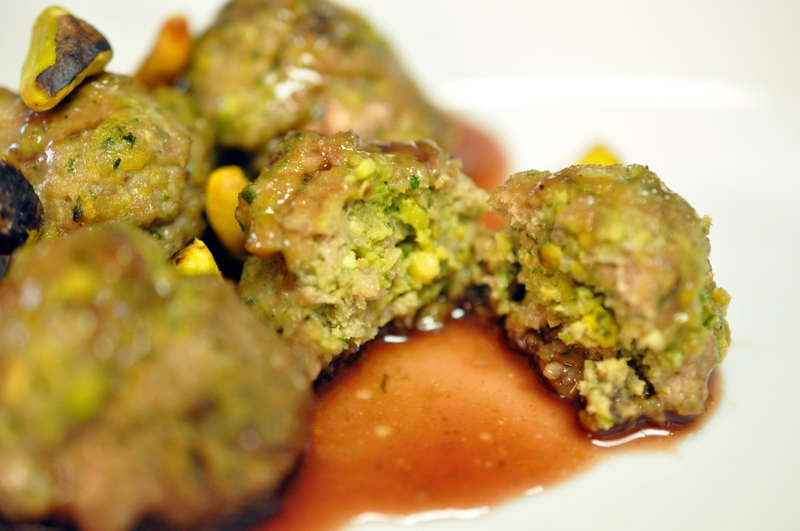 Reduce the oven to 250 degrees to keep the meatballs warm until ready to serve. I may have made them slightly smaller than the recipe called for because I cooked them for 7 minutes at 500 degrees and 7 minutes at 400 and they were PERFECT. Serve with brown rice. These were so moist and tender! It would also make a great appetizer, just pop toothpicks into them. Enjoy! 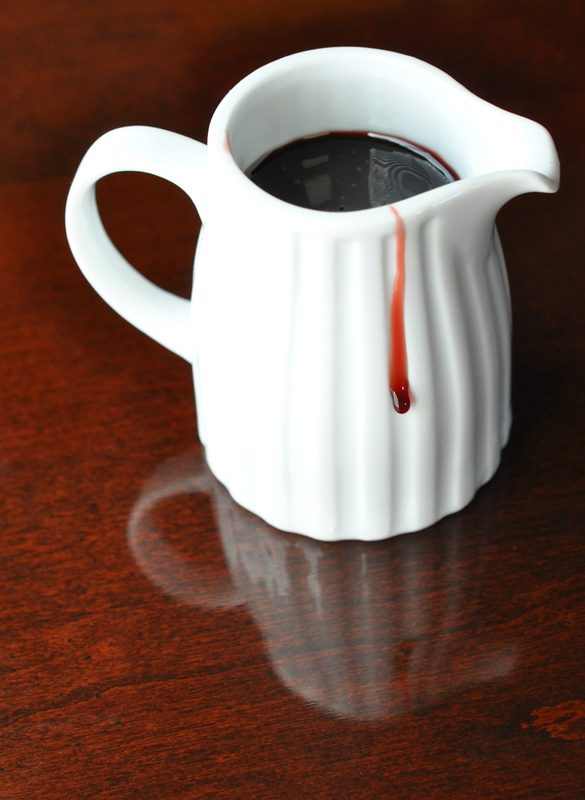 Pomegranate Molasses recipes are virtually all the same. There may be some small variations in ratios but I think any one would work fine. The one below is Alton Brown’s version. Pour all ingredients into a medium saucepan and bring to a boil, stirring until the sugar is dissolved. Reduce heat and simmer until it is reduced to 1 cup. It will be thick and syrupy. This should take about 1 1/2 hours but start keeping a closer eye on it after an hour. Oh, Sarah, this makes me just want to make a special trip to the store to get these ingredients. Thank you so much for sharing! Your photos are amazing, too.